Wind Damage - Manila Typhoon Center - Your online resource for typhoon updates. Tropical Cyclones do damage to homes, buildings, infrastructures, and livelihoods with strong winds, disastrous flooding and landslides that comes along with the torrential rainfall, coastal flooding and erosion due to the storm surge. Today we will deal with Wind Damage, the most looked at part in a storm. "I live on the 9th floor of a building: leaves were blown in by the winds. Flying GI sheets everywhere but mercifully, no shoddy construction in my neck of the woods. Areas with tall buildings create all sorts of funky wind tunnel effects so at particular moments, the different gusts led to raindrops being suspended in midair for moment"
Then I saw roofs flying again and I was scared it’s gonna chop my head off! Video Courtesy of James Reynolds - Earth Uncut Productions. _When you hear a typhoon bulletin over TV or the radio what is the first thing mentioned. Yes, its the wind. 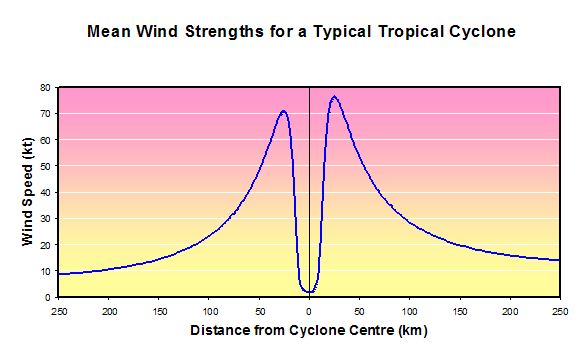 Its the main factor for a Classification of a Tropical Cyclone. 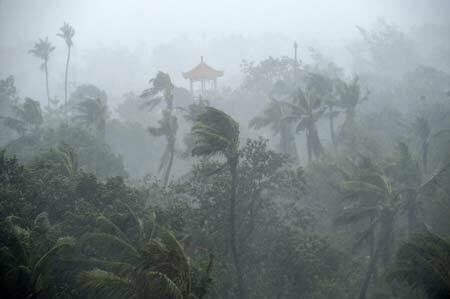 The most obvious element in a typhoon is the strong winds. Strong winds can damage or destroy vehicles, buildings, bridges, and other outside objects, turning loose debris into deadly flying projectiles. Tropical cyclones often knock out power to tens or hundreds of thousands of people, preventing vital communication and hampering rescue efforts. Tropical cyclones often destroy key bridges, overpasses, and roads, complicating efforts to transport food, clean water, and medicine to the areas that need it. Furthermore, the damage caused by tropical cyclones to buildings and dwellings can result in economic damage to a region, and to a diaspora of the population of the region. The extent of damaging winds will vary between cyclones. More importantly, the most severe winds will be confined to a small area around the outside of the eye. Often people will experience the winds in the outer part of a Category 4 or 5. They will believe that they have experienced a major cyclone, yet the winds may have only been Cat 1 or 2 strength. 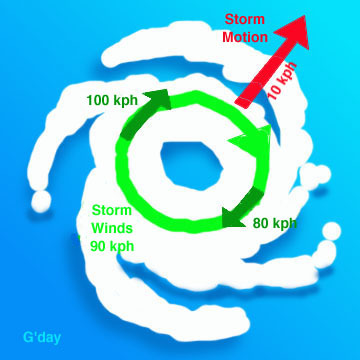 It is important to recognise the structure of a cyclone when assessing past experience. This will make a future direct hit less of a surprise. A 260kph Category 5 SuperTyphoon is TEN TIMES as severe than a 65kph Minimal Tropical Storm! True. Technically, any wind over gale force (tropical storm forced begins at 65 kph) can do damage by uprooting trees and damaging property. When winds reach 118 kph or higher, damage increases radically, with each 50% increase in wind speed doubling the dynamic force of that wind. A 120 kph wind is TWICE as damaging as a 80 kph wind, 160 kph wind is FOUR TIMES as damaging as 80kph, and a 250 kph wind is NINE times as severe as 80 kph! This is because the DRAG FORCE of wind, caused by aerodynamics and dynamic pressure of the wind flow, increases with a formula related to the SQUARE of the velocity. This is why a minimal hurricane with 120 kph winds only causes leaf and minor tree damage but a Super Typhoon like Reming/Durian with 250 kph (1 minute average) winds back in 2006 can destroy an entire city. What does Maximum Sustained Winds Mean? The maximum sustained wind mentioned in the advisories that the PAGASA or JMA or JTWC (or any weather agency for that matter) issues for tropical storms and typhoons are the highest surface winds occurring within the circulation of the system. These "surface" winds are those observed (or, more often, estimated) to occur at the standard meteorological height of 10 m (33 ft) in an unobstructed exposure (i.e., not blocked by buildings or trees). While a storm advice may refer to a certain maximum sustained wind or gust, there will be localized points where the winds will exceed this value, particularly in gullies, about ridges and between buildings where winds can be funneled by the landscape. PAGASA and JMA uses an average wind of 10 minutes sustained wind to provide TC intensity. The JTWC uses the United States standard of 1 minute sustained wind. This is the cause of the discrepancy in TC intensities between agencies. The Strongest winds in a Typhoon are in the RIGHT side of the storm. First, the "right side of the storm" is defined with respect to the storm's motion: if the typhoon is moving to the west, the right side would be to the north of the storm; if the typhoon is moving to the north, the right side would be to the east of the storm, etc. 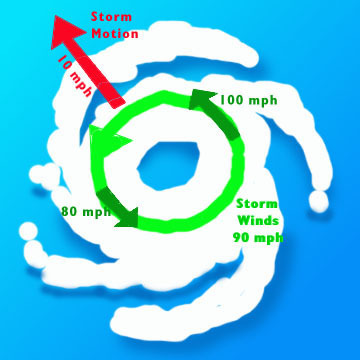 In general, the strongest winds in a hurricane are found on the right side of the storm because the motion of the hurricane also contributes to its swirling winds. A typhoon packing 160kph is moving west at 20kph. Thus, it would have 180 kph winds on the right side and only 140 kph on the left. Note that forecasting center advisories already take this asymmetry into account and, in this case, would state that the highest winds were 180 kph.